From his years of experience consulting to leading companies, psychologist Ben Dattner has discovered that at the root of the worst problems we confront at work is the skewed allocation of blame and credit. 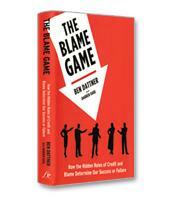 The only winning move in the blame game, Dattner shows, is not to play, and the insights and practical suggestions in this book will help readers, at any level of any organization and at any stage of their careers, learn to manage the crucial psychology of credit and blame for themselves and others. Consultant and executive coach Ben Dattner tells the story of one of his clients, a retailer who had traditionally placed its stores in malls but was expanding to free-standing locations. An eight-member team was put together to choose and open the new locations. However, infighting, the duplication of work and the inability to make decisions were sinking the team. Finally, one of the more experienced team members, whose suggestions had been constantly shot down, moved ahead on her own. Beth started making offers on locations and hiring architects. When the other team members learned of her actions, they united in blaming her for "mishandling" the search, as they told their boss. Unhappy about being scapegoated, Beth, who had done more in fulfilling the team’s mandate than any other member, left the company. As Dattner carefully outlines in The Blame Game, the scapegoating and blaming that goes on in the corporate world is not an accident. In fact, our brains are hardwired for self-serving biases — and that means taking personal credit when things go right and looking for others to blame when things go wrong. The roots of the blame game are not only found in nature, but also in nurture. As children, Dattner explains, we develop our sense of self largely on the basis of blame and credit. Most children not only seek credit constantly, but also believe that they deserve that credit. Conversely, children also believe that they are being unfairly blamed most of the time. As adults, we are less prone to echo unhappy children by immediately proclaiming that anything we don’t like "is not fair." However, in times of stress, people do tend to regress to childhood, Dattner writes, rejecting responsibility for problems and searching instead for someone to blame. Another challenge is the psychological phenomenon of transference, when we transfer emotions from our childhood onto people encountered in our adult lives — including colleagues and bosses. In addition to nature and nurture, some personality types automatically have a greater tendency to blame others, Dattner writes. Psychologists have identified three personality categories related to blame: Extrapunitive people are always looking to blame others; impunitive types simply refuse to accept blame to an extreme degree; and intropunitive people accept blame too easily, consistently assuming that everything is their fault. Within these categories are personality types that most readers will recognize from their work or personal lives. For example, the mischievous impunitive takes risks and cuts corners but refuses to accept blame when those risks lead to trouble. In The Blame Game, Dattner also explores the impact corporate cultures and leadership issues have on credit and blame within the organization. He ends the book with some tips on how to overcome the blame game — for example, by fighting groupthink and getting rid of people who throw others under the bus. 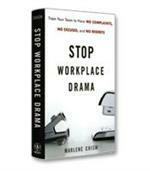 The Blame Game is a fascinating and learned look at a frustrating facet of corporate life. While the odds seem against blame-free companies, the best antidote, Dattner writes, is to be aware of the biases and impulses that pull us toward blame.